Frankly, the Los Angeles Kings have been pretty darned lucky so far this season. Anze Kopitar has one goal in twelve games. Dustin Brown has five measly points. Jarret Stoll’s decline is palpable. The clock is ticking on the Matt Frattin second line experiment. But wait, there’s more. As a team, the Kings are just 19th overall in goals scored (2.58 per game), 18th on the power play (17.8%) and 14th on the penalty kill (82.4%). They win plenty of faceoffs (55%) and shoot the puck with aplomb (32.6 per game), but when the day is done, they just feel mediocre somehow, at least when it comes to the offensive attack. With five former 30-goal scorers currently on the roster, four of whom have yet to see 30 candles on the birthday cake, that just shouldn’t be the case. And yet, thanks to a solid defense and an unblemished record after the sixty minute mark (4-0), the Kings have a very respectable 8-4 record, sixth best in the conference. With a sputtering offense that arguably has only half its primary scorers playing up to par, can they keep it up? As I discussed in this piece about Matt Frattin, the left wing position has been L.A.’s Achilles’ heel for the better part of three years now. The list of underwhelming top-sixers that have donned the crown (tiny as it may be in the current ‘home plate’ logo) spans some very familiar names, including Alexei Ponikarovsky, Marco Sturm and Simon Gagne, amongst others. Even Kings’ captain Dustin Brown is a converted right-winger, whose solid overall statistics over the years mask his well-chronicled streakiness. Sure, Dwight King managed a hat trick a few nights ago against the Coyotes, but if you think he’s the answer, you obviously don’t understand the question. The lack of a consistent scoring threat from the second-line left wing position just isn’t helping offensive consistency. That said, nobody would disagree that although they have managed to overcome the problem in recent seasons, the search should continue in earnest. Enter Tanner Pearson. 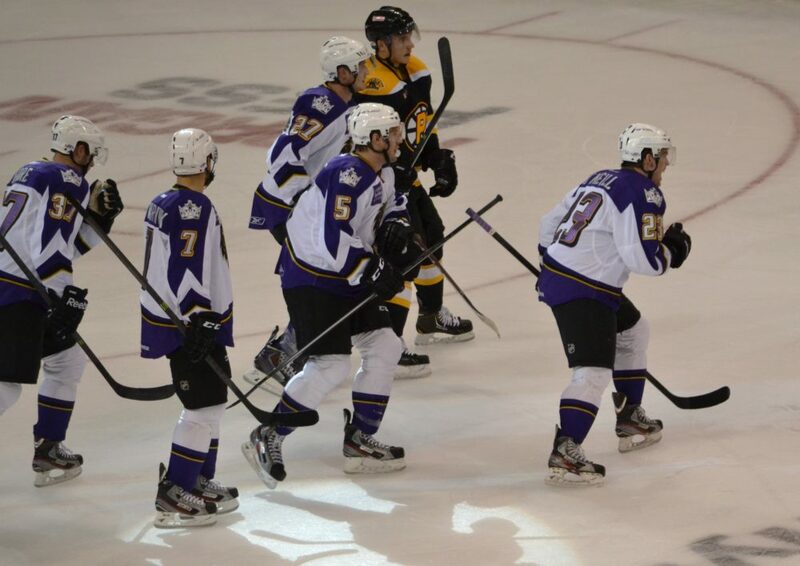 The Manchester Monarchs have seen Tanner Pearson’s development grow substantially these past two seasons. Drafted in the 1st round (#30 overall) of the 2012 NHL entry draft, Pearson has all the physical tools, including height (6’0″), weight (203 pounds), and speed. Per this Elite Prospects report, he also has a good shot and perhaps even more importantly considering Darryl Sutter’s offense, is not afraid to go to the net. The Kings have had their share of successful garbage-goal scorers over the years, the most noteworthy being Luc Robitaille. With Dustin Brown experiencing a serious power outage, a major driver of the team’s attack is currently in neutral. It is possible that Tanner Pearson, considered by some to be a poor man’s Dustin Brown, could fit the bill. Pearson’s improvement arc has been impressive. 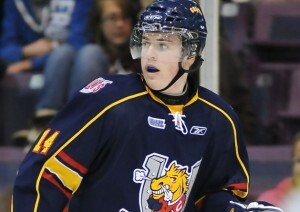 In 2010-11, he finished fifth in total points for the OHL’s Barrie Colts, notching 15 goals and 27 assists in 66 games. Furthermore, although +/- is widely considered an overrated measurement of two-way ability, at -12, his was one of the best on the team. In 2011-12, his production virtually exploded: he recorded 37 goals and 54 assists, and enjoyed a team-leading +21 in the plus/minus department. Upon reaching the AHL Manchester Monarchs for the 2012-13 campaign, Pearson accomplished something many rookies struggle with: consistency. He finished fourth on the team in goals with 19, and his 47 points was fourth as well. Not surprisingly given his history, at +17, his plus/minus was near the top of the roster as well. With five goals in ten games so far this early AHL season, Pearson hasn’t seemed to miss a beat. At just 21 years old, he could no doubt benefit from additional seasoning in Manchester. And yet, both Kopitar and Brown had made meaningful contributions to the Kings by that age, and that problematic left wing slot is practically crying out for a solution. Could Pearson be the answer? I’ve made no secret of my belief that Dustin Brown (net presence), Anze Kopitar (playmaking center) and Justin Williams (sniper) should remain the team’s top line, and that Darryl Sutter should therefore resist his mad scientist impulses to tinker with it. It’s the second line that could use a more permanent solution on the left side, someone more skilled than Dwight King and more consistent than Matt Frattin. Add Tanner Pearson (net presence) to Mike Richards (playmaking center) and Jeff Carter (sniper) and the ingredients for two balanced scoring lines are there. Yes, he’s a rookie. Obviously, he may not be ready for prime time. But the Kings are built to win now, and with the vacancy they are experiencing at that slot, it’s holding the team back from reaching it’s potential. Speaking of which, Pearson has loads of it, and with his early success in the minors, seemingly little more to prove there. It’s time to call Tanner Pearson up and give him a shot at what the other relics, retreads and miscellany have yet to accomplish: being a consistent scoring threat from the second line left wing. Somewhere, Alexei Ponikarovsky just felt insulted. The NHL regular season schedule was released on Friday. Check out our partners at TiqIQ for the best deals on Los Angeles Kings tickets for all 2013-14 games.